A few years ago, I was flying an airplane called a Cirrus SR22 from Los Angeles to Mexico, Guatemala and Honduras for a project. If you’re unfamiliar with this airplane, the best way to describe it to non-pilots is to ask them to picture a 3-Series BMW with wings. The SR22 is the best-selling single-engine piston aircraft in the world. It’s a lot of fun to fly and I love that it has a ballistic parachute system for enhanced safety. On this one leg of that trip however, the airplane was less fun. I was at 9,500 feet flying from Brownsville, Texas to Veracruz, Mexico, where I was planning to stop for fuel before continuing to Merida on the Yucatan. I was admiring the view in between scans of the instruments and planning our descent into Veracruz when I noticed an electrical anomaly indication on my flat panel displays; I was having an alternator failure. Having trained for instances like this, however rare they may be, I went through my memorized routines and backed my actions with checklists. I had already been flying the SR22 for many years at the time of this trip so I knew the airplane and its systems pretty well. And as we descended for the airport at Veracruz, having pulled circuit breakers taking both alternators offline and shedding as much electrical drain on the airplane’s battery as possible, we made a normal, uneventful landing, taxied to parking, and spent a couple days in Veracruz getting new alternators installed so my friend and I could continue our trip and meet up with our friends in Honduras and Guatemala. Fact is, I want to be as familiar as possible with my airplane, and my gear, so I use the best gear that I’m able to own, rent, borrow, hire, whatever, and that’s also why I fly the Yuneec Typhoon H Pro UAS (unmanned aerial system). When I sit in the Cirrus, it’s readily apparent that the company spent a lot of time thinking about the ergonomics and human factors of how a pilot interacts with an airplane. Now that I’ve been flying the Typhoon H for a while, it seems obvious that many of those same considerations of performance, usability and reliability were also designed into the Typhoon H and its systems. Fact is, one of the most appealing things about Yuneec, to me as a pilot, is that the company has a long history in not only remote controlled electric aircraft, but they also have designed and produced full-scale airplanes like the eSpyder and E430. One of the company’s founders is a pilot, so that further inspires confidence in me about their approach to aviation. While the Typhoon H hexcopter is a lot of fun to fly, I actually see it as another tool to enhance my creative value to a client. 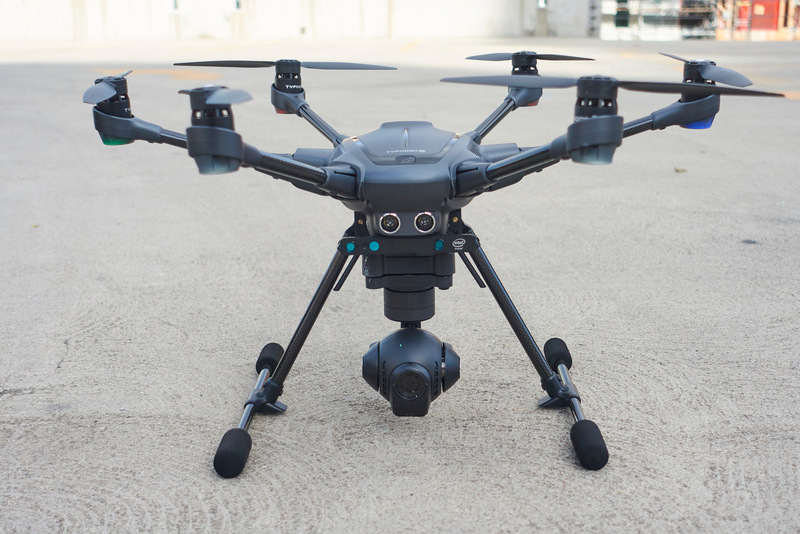 It’s a camera platform first and foremost, and when it comes to UAS camera platforms, I want a system that has good automation, is easy to operate, inspires confidence, and is smooth, precise and stable. And one thing that I should mention here is that according to FAA regulations, operating a drone for commercial purposes requires the operator, the pilot in command, to have a Remote Pilot certificate, also known as a 107. Since I was already an airplane pilot and am well-versed in aviation weather and how the airspace system works, getting this license took only a couple hours of drone-specific study and passing a short written test. The process for non-pilots is more exhaustive since there is a lot aviation-specific knowledge to cover for the certification, which is good! If you have designs on using unmanned aerial systems to support your creative endeavors, I suggest you get cracking on training for your 107. But back to why, as a pilot, a photographer and a filmmaker, the Typhoon H checks so many of the boxes of what I consider a terrific aerial platform. Six rotors vs. four: Since the Typhoon H is a hexcopter and not a quadcopter, it benefits from manifest advantages in reliability, stability, redundancy and performance. Redundancy and reliability: The Typhoon H needs only five of its six rotors to remain aloft, so unlike any quadcopter, if one motor were to fail during flight the drone can still land safely. Stability: Key for an aerial camera platform. When flying in gusty winds that would upset a typical quadcopter, the extra aerodynamic authority inherent to six spinning rotors pays dividends in enhanced stability and how well the H is able to maintain its position and minimize drift. 3-axis, gyro-stabilized and anti-vibration gimbal: Since the Typhoon H’s landing gear retracts with the flick of a switch, the camera has an unobstructed 360 degree view, allowing camera movements and shots that would be much more challenging to get with a fixed-gear quadcopter. And since the camera is gyro stabilized and insulated from vibration, still photos are sharp and video is buttery smooth. ST16 Controller: An integrated transmitter, receiver and large, 7 inch HD (720P) touchscreen monitor receiving real-time video transmission from your flight. The Typhoon H comes ready to fly out of the box. There is no need for an external device to operate the camera. An optional Team Mode allows the pairing of a second ST-16 or Wizard controller so one pilot flies the aircraft and another operator runs the camera. This two-operator arrangement is typical when flying larger drones and on larger-scale productions. There are numerous camera options for the Typhoon, and they are hot-swappable – for example, 4K to thermal imaging. For the past few weeks I’ve been flying a new camera with a seven-element, 50mm-equivalent lens. This lens affords me a more cinematic look to my footage, with sharp detail, good contrast and less distortion than wider lenses. Of course, the camera specs are latest-generation for a drone at this level – 4K UHD up to 30 FPS and full HD up to 120 FPS, and 12MP DNG stills. There are four color profiles, Natural, Gorgeous, Night and Raw, which is not really Raw. It’s a bit desaturated like a Log picture profile but actual Log is not available. Bitrates could be higher, and to that end, the company has big plans for continued innovation and evolution of their imaging systems. Automation: Just like the autopilot in the airplane I fly, on-board automation on the Typhoon H reduces workload, increases safety, and allows me to program a specific flight path and fly more precisely. There are numerous modes for different scenarios including Orbit, Journey, Follow Me and others. This also allows the repeatability of shots during production. A next-level Smart Obstacle Clearance mode powered by Intel called Real Sense Technology instills further confidence especially in Follow Me mode. I’ve also had a good experience thus far with the company’s customer service. This is key as a professional creative – to know I have responsive technical support if some issue were to arise. In the drone community, there has been much talk and speculation about the health of the industry as a whole. And in the past year there have indeed been a few shakeups. Autel, GoPro, 3D Robotics and Parrot have all announced layoffs and cut staff. Yuneec was also not immune to this restructuring. 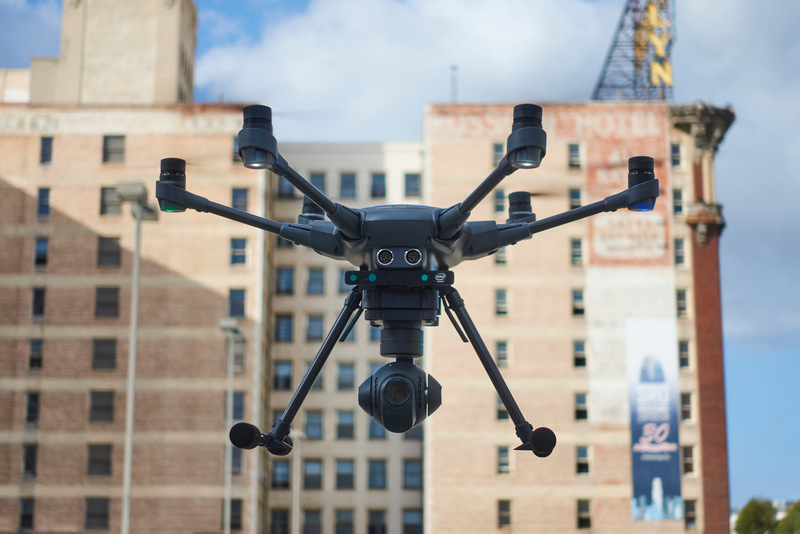 I spoke to the CEO of Yuneec USA, Michael Kahn, when writing this piece since I felt it was worthwhile to address the issue. I was recently at an airshow here in southern California and a drone distributor made some questionable claims about the health of the company. In the interest of clarity, Kahn told me that Yuneec USA grew very quickly over the 2.5 years they have been on the market here in the U.S. In fact, as Kahn puts it, they grew too quickly, and that necessitated the difficult decision to trim staff by 25% as they straightened things out. Kahn said he sees moving forward a strong market for their unmanned aerial systems. 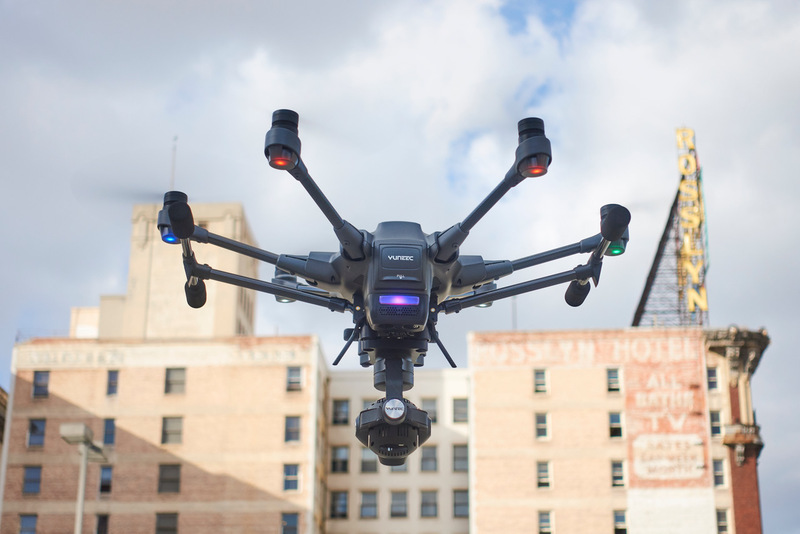 They launched a new drone at CES this past January, the H520, aimed at a more commercial customer – think inspection, law enforcement, real-estate, and yes, with their two 4K camera options, videographers and cinematographers. The H520 is slightly larger than the Typhoon H and is therefore even more stable in flight. Overall though, Kahn said sales are strong and they have some terrific products in the works, including some that will appeal to those seeking very high image quality. To me, this is great news. I’m still relatively new to drones and aerial camera platforms, but as soon as I started to fly my Yuneec Typhoon H Pro, and I started to see the images it was capable of producing, I was instantly hooked. The Typhoon H is an amazing creative tool. Jeff Berlin shoots fashion, beauty and celebrity portraits for some of the world’s top editorial and commercial clients, is a Sony Artisan and an experienced aviator. He is also a published writer and was editor of three national consumer aviation magazines — Plane and Pilot, Pilot Journal and PilotMag.